A film that I've received a lot of emails from confused readers about is Welcome to Marwen, and I don't blame them for being mystified by it. Based on a true story documented in the excellent documentary Marwencol, the film stars Steve Carell as a man beaten nearly to death by neo-Nazis. To help recover, he builds a fictional fantasy world out of toys depicting the important women in his life. The first trailer was released and it played rather silly, with the action figure characters looking like refugees from Small Soldiers. So the movie's release date was pushed a little bit, a new trailer was dropped and it was much better, giving the story the dramatic heft it should have. And now the third trailer has arrived and I think it works as a balance of the two. The film is directed by Robert Zemeckis, and surrounds Carell with a cast that includes Leslie Mann, Diane Kruger, Merritt Wever, Janelle Monáe, Eiza González, Gwendoline Christie, Leslie Zemeckis, and Neil Jackson. Here's the official synopsis: When a devastating attack shatters Mark Hogancamp (Carell) and wipes away all memories, no one expected recovery. Putting together pieces from his old and new life, Mark meticulously creates a wondrous town where he can heal and be heroic. As he builds an astonishing art installation—a testament to the most powerful women he knows—through his fantasy world, he draws strength to triumph in the real one. 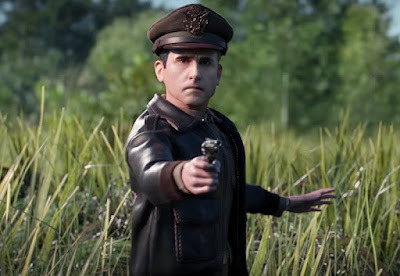 In a bold, wondrous and timely film from this revolutionary pioneer of contemporary cinema, Welcome to Marwen shows that when your only weapon is your imagination…you’ll find courage in the most unexpected place. Welcome to Marwen opens December 21st, which is prime awards season real estate. The potential is certainly there, but there's also the potential for a tonal misfire. We'll soon find out.